The Godly Play (R) approach helps children explore their faith through story, to gain religious language, and to enhance their spiritual experience through wonder and play. Based on Montessori principles and developed using a spiral curriculum, the Godly Play (R) method services children through early, middle, and late childhood and beyond. Revised and expanded, The Complete Guide to Godly Play, Volume 4, offers new concepts, new terminology, new illustrations, and a new structure that stem from more than 10 years of using Godly Play (R) with children across the world. Thirty to forty percent of the text is new or revised, including a new lesson, revised Introduction, and a full Appendix. 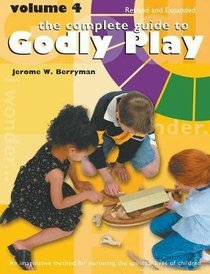 About "Complete Guide to Godly Play, the - Volume 4- Imaginative Approach For Telling Scripture Stories For Grades K-6 (#04 in The Complete Guide To Godly Play Series)"
Jerome W. Berryman is a consultant in the areas of religious education, child development, and spiritual direction for children. He is the author of "Godly Play: An Imaginative Approach to Religious Education".